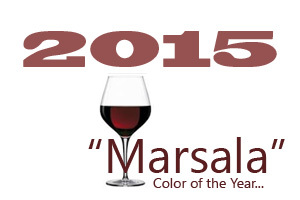 The Pantone Color Institute named “Marsala” as this year’s color of the year. If you are considering this color for your wedding this color combines well with neutrals. If you want to pair it with blue it works best with a vibrant blue. Golden yellows, turquoise and teal are other colors that work well with this new 2015 color. For weddings – it is rich, full bodied, warm and inviting. It is a shade that works well for both men and women. The richness of the color automatically speaks of elegance and sophistication which is a good starting palate for a wedding. For parties it can be used as the main color and then depending upon the party theme you can add in the other tones. For a formal party neutral works well with Marsala. If you want to add some excitement mix it with a strong blue accent color.